The sizes, specifications and American Flag Dimensions are detailed below and ensures that the Stars and Stripes are all correctly proportioned and the correct size. These sizes and specifications are contained in Executive Order No. 10798 of January 3, 1959, which, strictly speaking, govern the flags made for, or by, the government of the United States of America. However, many American flags on sale to the general public have different length-to-width ratios. The picture to your left provides information about the names for different parts of the flag and the flagpole. The American Flag Dimensions are clarified by a description of the Stars and Stripes. The design of the American Flag depicts 50 white five pointed stars on a blue rectangular background and 13 horizontal stripes. The 13 equal horizontal stripes represent the first 13 American states and are displayed as red at the top and bottom with alternating stripes of red and white stripes. The 50 stars equal the number of States in the Union and are arranged in nine horizontal rows of 6 stars at the top and bottom that alternate with rows of 5 stars. The blue canton field in the upper quarter is specifically referred to as the "union" (the stars) which is referred to in the dimensions info. The 'union' displays the stars next to the flagpole which extend to the lower edge of the 4th red stripe from the top. The Hoist is the width and the Fly is the length. The 'External halyard' is the name given to the rope system used for raising and lowering flags that are located on the outside of flag poles. The 'internal halyard' is a rope, cord or cable system located on the inside of flag poles used for raising and lowering flags. Flagpoles are often decorated with a peak or 'Finial' such as a decorative ball or eagle. The American Flag dimensions and proportions are those approved by Executive Order of President Dwight D. Eisenhower on August 21, 1959. 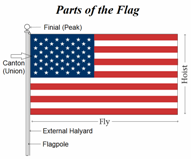 The American Flag Dimensions include the ratio, the width of the Hoist, the length of the Fly, the width of the Width of the canton, the length of the canton, the diameter of stars and the Width of stripe. The most popular dimensions are 2 × 3 ft. or 4 × 6 ft. (flag ratio 1.5), 2.5 × 4 ft. or 5 × 8 ft. (ratio 1.6), or 3 × 5 ft. or 6 × 10 ft. (ratio 1.667).